If you’re still in two minds about what could be the perfect option for your kitchen countertop or bathroom, here you’ll find information about granite and why so many people choose it over other materials. Granite can withstand high temperatures like hot pans and you can even cut directly on it, without using your cutting board, and it won’t get damaged in any way – that’s just how durable it is. Usually, when people talk about granite, they have slab granite in mind. But you should be aware that slab granite isn’t the only option for your new granite countertop. Here are the differences between slab granite, modular granite and tiled granite. This type of granite is regarded as one of the most luxurious countertop materials. This is the first thing that comes to mind to many people when somebody mentiones granite, and it’s no wonder why! Slab granite is produced in a workshop or a factory so that you can custom fit it into your home. In case you didn’t know, granite is extremely heavy and hard to work with, so it’s for the best to hire professionals to install it in your home. Slab granite is the most expensive granite type you can choose. Having its weight and cost in mind, as mentioned before, it would be for the best to prevent any chances of damaging it by relying on professional help! Contact Denver Granite to find out more about your options! Modular granite countertops are made out of pre-cut pieces of granite. This a good option for you if you own a conventional kitchen. It’s not as perfect for custom kitchens, but with some tinkering and changes here and there, there’s a possibility you could make it work. If you’re into DIYs and have a standard kitchen, this just may be the perfect option for you. Your biggest obstacle is making the granite seem seamless when you put the pieces together. This type of granite is not as expensive, and you can even install it yourself! 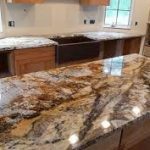 This type of granite is constructed by placing tiles edge to edge and securing the whole thing with epoxy, so as to create a solid countertop. Tiled granite countertops are less expensive than slab granite countertops. When you find tiled granite countertops constructed in a proper way, you’ll be pleasantly surprised by their high-quality look. By choosing tiled granite, you’ll achieve a refined look for your kitchen, while saving some money at the same time. However, there is a downside too. The seams make it more difficult to clean. All in all, they are definitely cheaper than slab countertops and they are more expensive than other tiled materials. That is the main reason why many people will save up some more money and go from tiled to slab granite. 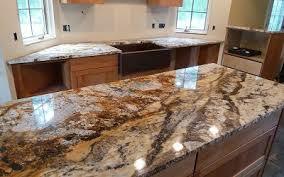 Granite countertop will definitely make your house more elegant and posh in the best possible way. All you have to do now is pick the perfect option and start remodelling your kitchen!